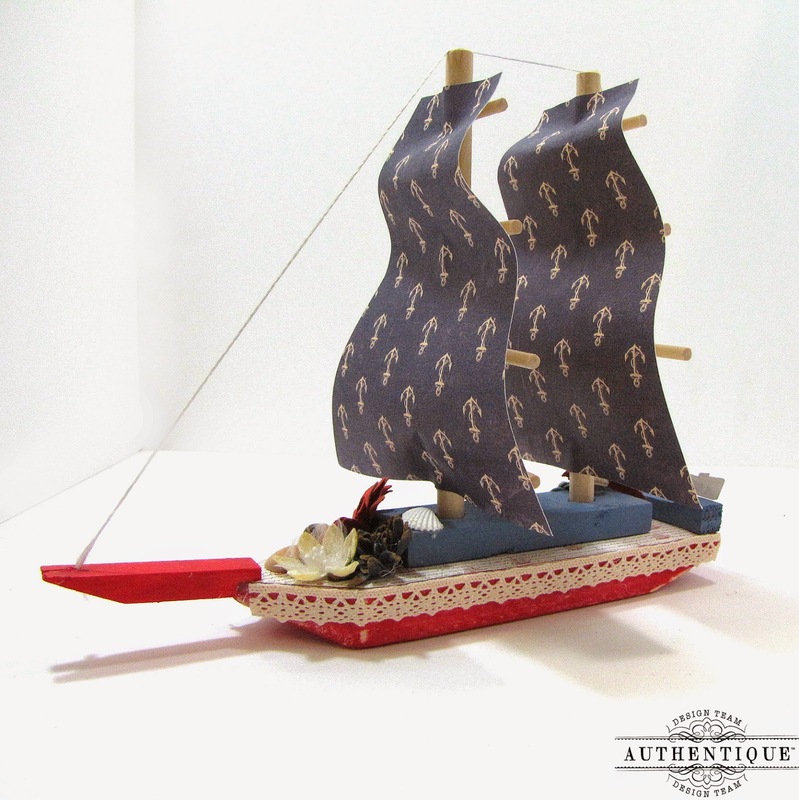 For my project I did a toy wooden sailboat all decked out in Authentique's 'Anchored' paper line. I found this wooden toy boat in the kiddie hobby section at my local craft store. It came in a bag and one has to assemble it together & design the boat to their liking. 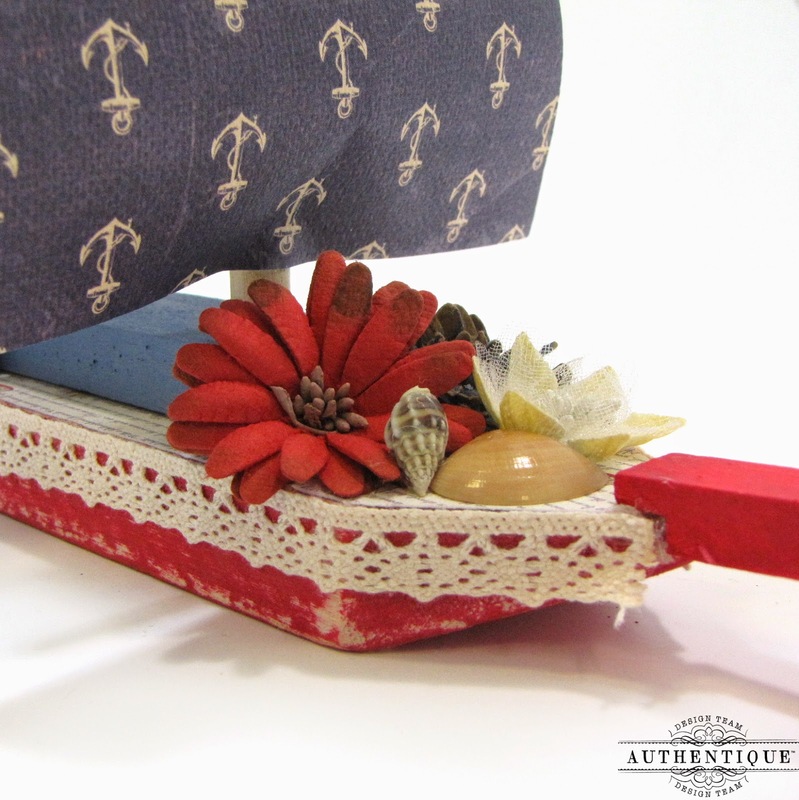 It's amazing what a bit of paint, paper, flowers & trim will do to a simple wooden sailboat! All of the flowers & seashells seen on the boat are by Petaloo. The trim that goes around the bottom of the boat is by Petaloo as well. I painted the bottom of the boat red & then sanded it down to give it a worn look. Here's the back of my boat. I named it 'Anchored'! lol How befitting & original eh? This little guy will be displayed in my son's room for now. It ended up being just the right size & best of all, the colors match his room! Thanks for stopping by & enjoy the rest of the week. Before you know it, those patriotic holidays will be upon us like Memorial Day and the 4th of July. And what better way to help set the mood than an easy to create festive canvas piece for decorating around the home! 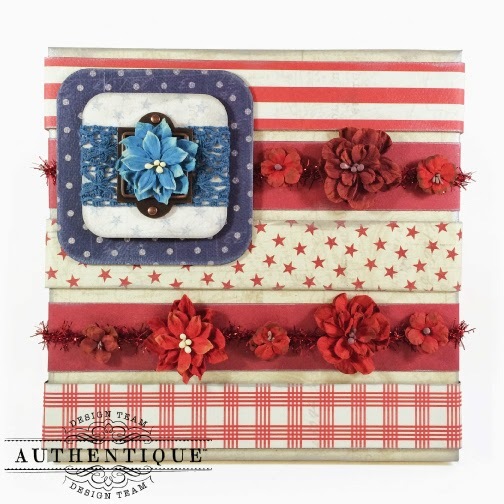 The great red, white and blue inspired patterns found in the "Anchored" paper collection makes decorating for these American holidays a snap! Begin by covering a canvas with "Still" paper and trim to size. Highlight edges of the covered canvas with Delicata Silver. Cut strips from "Cruise," "Deep" and the backside of the "12 x 12 Enhancements" sheet to create the patterned stripes, and the solid red pieces from the "Foundations One" paper. Edge all strips with Delicata Silver. 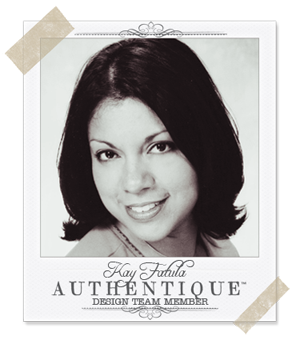 Use dimensional adhesive for the patterned paper strips and adhesive of choice for the solid strips. Add ribbon over the solid red stripes. To create the blue star field, use the Rounded Squares die to cut the larger layering piece from "Particle" and small piece from "Guide" paper. Attach the blue lace ribbon around the "Guide" paper and add a label plate with included brads onto of the ribbon before adhering the pieces together. Finish the the canvas by embellishing with dahlia flowers from Petaloo. wonderful projects - but that little sailboat just knocks my socks off! I would love to figure out how the base is made LOL. Gorgeous papers and lovely embellishments - terrific combination! That boat is awesome. What a great idea!! I have a nephew born on the 4th of July, these papers will be perfect for his card. Cute projects! Love the papers on the boat and that card is so pretty. The boat is amazing. I'm sure your son will be so proud to display it in his room and show it off to his friends. I love the nautical look of the collection - as well as the patriotic side of it. Great job on the canvas also. John, I love your canvas piece. Just the right decoration for July. Lovely sailboat, love it! The canvas is amazing too! Cute sailboat and Love the canvas! 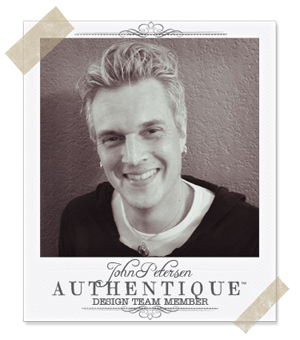 Love authentic papers! Very cute projects this week. Wow! These projects are stunning! How creative! Great projects yet again!! I love the sail boat!! Such fun. Both projects are just great! Such great talent. So glad you're in the Hop! The projects are just amazing. Loving this week of inspiration. I agree with everybody else in that this was an amazing week of fantastic projects and ideas to get us crafters off to a great start! Thank you for hosting/sponsoring. I love to use red, blue and white, but lately had no ideas with those colours, so thanks for the great inspiration! what a fantastic sailboat. You can really see how the breeze is moving the sails! That boat is great looking! The sails with the wave and shells & flowers on board are a nice touches! The canvas decor is nice too. I love the patriotic colors & look. That boat is AWESOME! I would never think of altering a wooden boat. It looks gorgeous! The canvas piece is very show worthy and would look good on a mantel or on a table! Thanks for sharing! Wow even more gorgeous creations! The boat looks amazing and I love the canvas decor too. 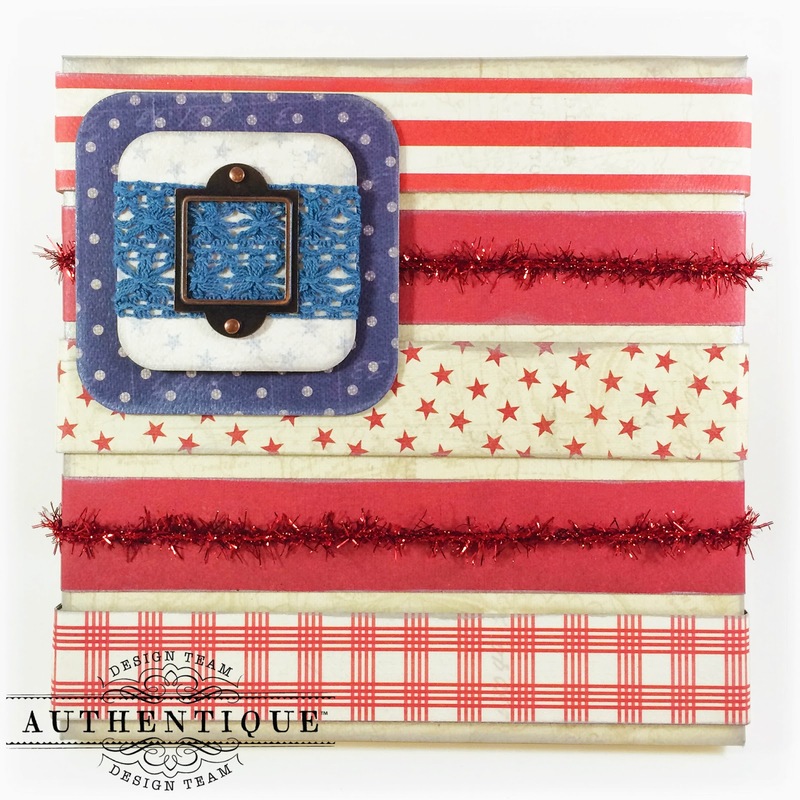 Love these papers - they are so perfect for either nautical or patriotic projects. My shipped has sailed for those projects today!!!! Absolutely adore that little boat! What a conversation piece that would be! Gorgeous papers! artists' ideas for these projects. Beautiful boat, love those sails! And I love that canvas piece too, with the tinsel and flowers. Great job!! Thanks for sharing. Using a bookplate as a buckle is so clever. I love the trims and the way you put the flowers in strips. Just amazing. The ship & canvas are fantastic!!! I just love this collection. Can I come sailing with you! Wow!! Love that sailboat. So cute and the cards are fabulous. Thanks for the great inspiration.. It's such a fun week. Found your paper through the Unity Stamp Co and fell in love. Newbie here to the blog. Lovin the site! Super cute boat, just adorable! Every day there are such beautiful projects with this paper and Petaloo. If we can't find some inspiration on these blogs, then we aren't trying. lol Thanks for sharing these great ideas with us. Clever idea to decorate a boat and very festive canvas. Great boat and cards! This is the time of year we are making these red and blue cards for Operation Write Home, so the designs and timing are wonderful! Thanks! The boat is so fun! I love the canvas. It's very patriotic! I particularly love the cards! I love the stripes and colors! The ship is amazing! Love how the sails look like they are rippling in the wind. Great new paper line! My husband made a boat like that--I am thinking I will pirate it and do a makeover. I love this ship! What a cute sailboat! 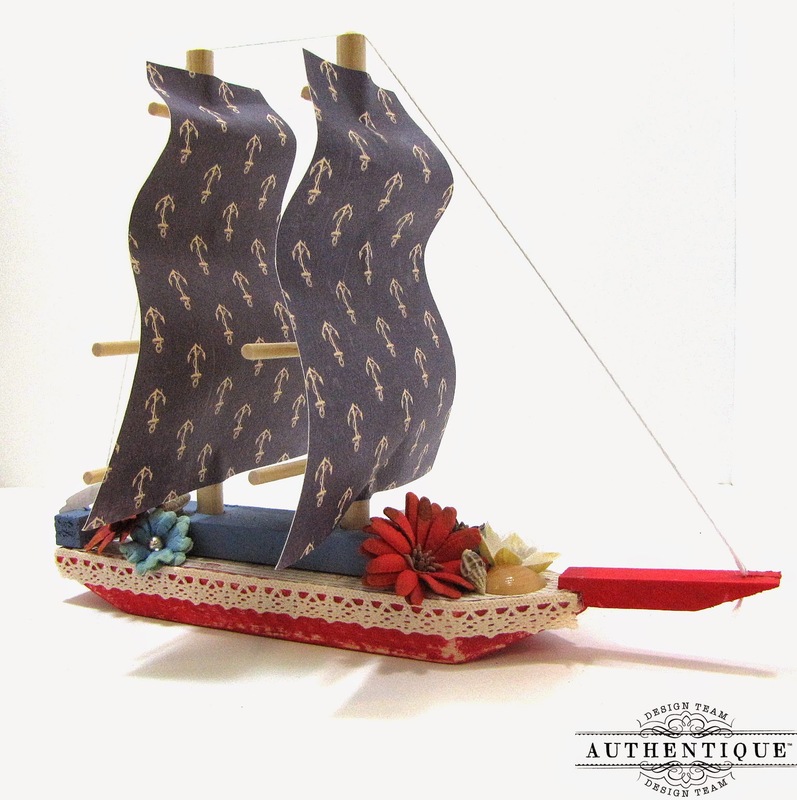 I love the sails and embellishments, thanks for sharing. Beautiful projects! I love the ship and the canvas! Gorgeous details on both! 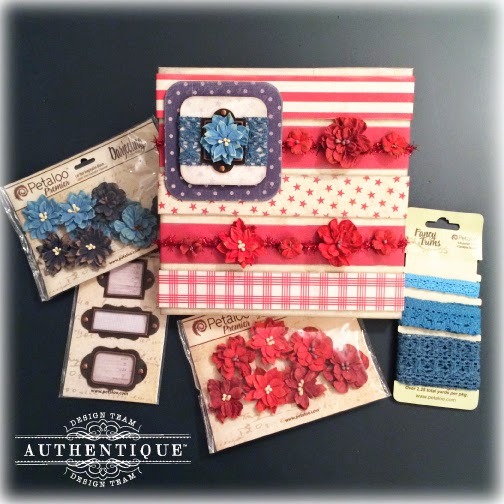 Great idea that this paper collection could be used for 4th of July projects. It is always great when you can find different theme uses for your paper collection. I'm ready to "set sail" with these great projects!! I can't wait to make John's canvas...who doesn't love the ole" "red/white/blue"!! The sailboat is also just sooo creative!! I think the "Hubbs" would really enjoy it!! WOW - what an SUPER COOL sailboat Kay - LOVE IT ALL, from the super sails and pretty trim around the deck to the beautiful flowers!!! BEAUTIFUL canvas John - LOVE the design, the paper panels, flowers, lace and trim!!! 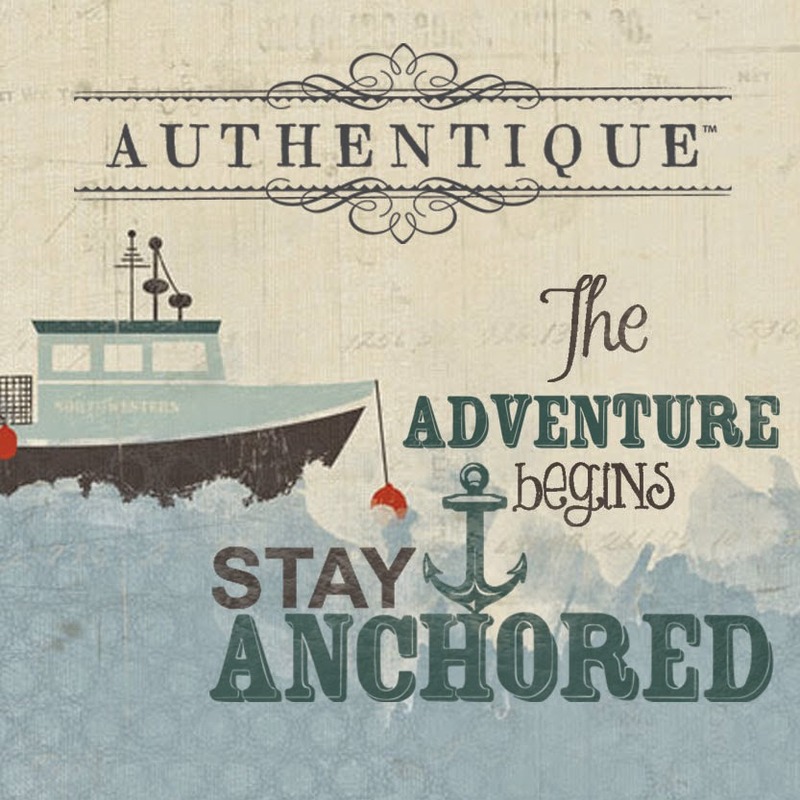 The anchor's been hoisted, the creativity ship has sailed...it's destination...the Authentique port of inspiration! Thank you for sharing! I'm loving all the great projects here this week! 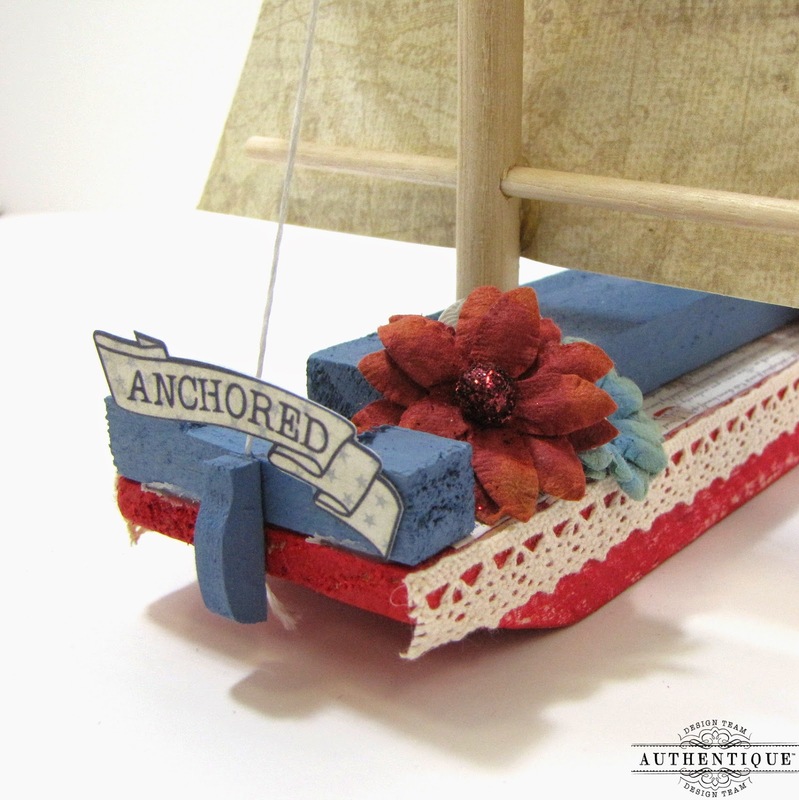 Such talented designs with the cute boat and the fun canvas! So enjoying your inspirations!